Dubai: Foreign flows are staging a comeback on Saudi Arabia’s stock market, helping the Tadawul All Share Index outperform its regional peers. After outflows in October and November, net inflows from foreigners came in at $320 million (Dh1.18 billion) in the first 10 days of the January. This compares with inflows of $1.58 billion over the entire 2018 financial year. This rally has been driven due to foreign flows, and this may continue for another three to four months. Foreign ownership stood at $6.5 billion in the same period, just 32 per cent lower than the peak of $9.6 billion seen in June last year. These large inflows have resulted in an 8 per cent jump in the Tadawul over the last 10 trading sessions, dwarfing mild losses posted on the Dubai Financial Market (DFM) general index or even on the Abu Dhabi Securities Exchange (ADX) general index, which are both down around 1 per cent since January 1. On Wednesday, the Tadawul index closed 0.71 per cent higher than the previous day’s close at 8,406.47, after hitting an intra-day high of 8,423.62, just 80 points away from the keenly watched 8,500 mark — a level last seen on July 23. “This rally has been driven due to foreign flows, and this may continue for another three to four months. We may see some profit-taking in April after we see the first-quarter results,” Mohammad Shabbir, head of funds and portfolios at Saudi Kuwaiti Finance House (SKFH), told Gulf News. Cement company shares resumed their rally after a gap of two months. Tabuk Cement closed 4.82 per cent higher at 11.74 Saudi riyals while Saudi Cement was up 4.09 per cent to close at 53.50 riyals. Yanbu Cement closed 2 per cent higher at 24.02 riyals while Cement East rose 3.12 per cent to 22.46 riyals. 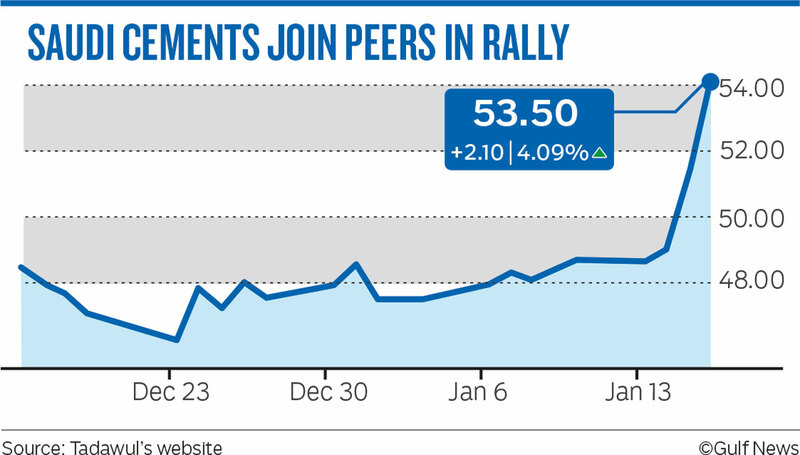 “This positive momentum [in cement stocks] will continue for the next few weeks,” Shabbir said. Cement stocks last rallied in October last year before trading sideways. The Dubai index displayed a mixed trend as Emirates NBD and Emaar Properties pushed the market higher while Damac Properties witnessed selling. The index closed 0.41 per cent higher at 2,500.76. Air Arabia slipped 0.97 per cent to Dh1.020 while Damac Properties fell 3.3 per cent to Dh1.26. The Abu Dhabi index closed 0.02 per cent lower at 4,982.62 on a day that saw Abu Dhabi Commercial Bank (ADCB) rise 0.72 per cent to Dh8.45 while Dana Gas eased 0.41 per cent lower to Dh14.60. Elsewhere in the Gulf region, the Muscat MSM 30 index closed 0.51 per cent lower at 4,258.10 while the Qatar Exchange index closed flat at 10,761.79.